Product information "Bosch TAT3A0133G - Two Slice Toaster"
Breakfast just wouldn't be the same without toast. The TAT3A0133G toaster offers even browning and comes with a removable crumb tray. This Bosch toaster keeps things simple. With just a few knobs and buttons to control, you can get your toast just how you like it, every time. One knob lets you adjust the bread’s heating time, where you can choose from six different settings. There’s even a large red cancel button if you need your toast sooner. Each toasting chamber can also be used independently, giving you more flexibility. Whether you like your slices gently heated or brown and crunchy, you can achieve perfect results with ease. This Bosch toaster is easy-to-use but still uses advanced technology for top-class toasting. Unlike some models, the TAT3A0133G won’t leave the end of your slice untoasted. It uses large panel heating elements and an automatic bread centering system to ensure even bread heating. There's nothing worse than getting your toast stuck, and it’s dangerous trying to remove it with a fork or your finger. Bosch has eliminated this problem with the TAT3A0133G's high rise facility. With safety in mind, this toaster also has an automatic shut-off function. Want some warm rolls to have with soup on a cold day? The TAT3A0133G comes with an integrated warming rack. Simply press the warming rack switch and then place your rolls on top. What's the handiest thing about this toaster? The removable crumb tray. It saves hours of hassle when you clean the machine. 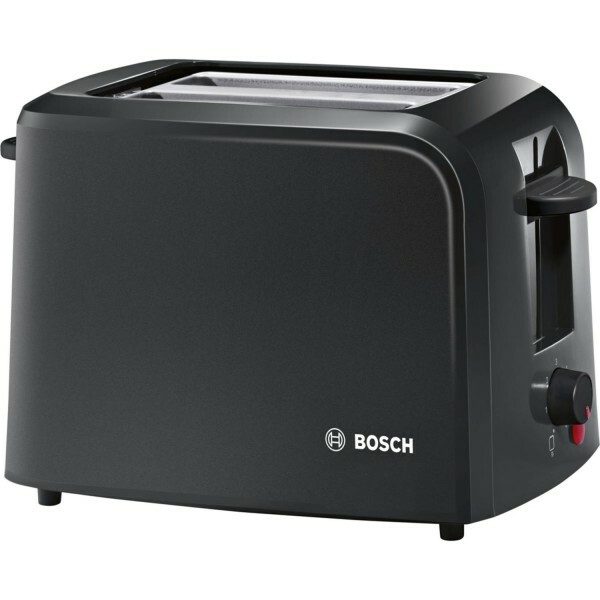 Related links to "Bosch TAT3A0133G - Two Slice Toaster"
Customer review for "Bosch TAT3A0133G - Two Slice Toaster"